There is nothing funnier then watching a load of blokes on a stag do messing about. These days everyone has a smart phone with incredible cameras so sharing and uploading these videos to YouTube couldn't be easier. Now if you're looking for ideas for the ultimate stag do prank this next video shows how great planning and co-operation from the bride-to-be can lead to an incredible video. Now bear in mind the stag actually got shingles after the stress of this prank and he nearly missed his wedding! In the 90's (the very start of the hen and stag do boom) I just started working in the stag and hen industry (with another company not DesignaVenture), groups were mainly booking 1 activity and then maybe a trip to a lap dancing club (if the city had one) and then onto a nightclub before getting their heads down in a B&B or bunk house. Also in the 1990's it was rare for a stag do organiser to have the opportunity to work with loads of city centre bars, and hotels just the mere mention of the words "stag do" doors would be shut in your face, phones would slam down and people would run for cover. Also remember pubs would close at 11pm and you would come out of a club stinking of smoke! 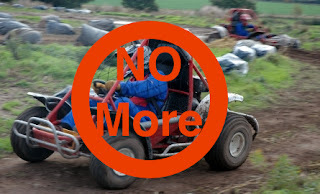 Stag parties who booked karts had loads of fun racing lawn mower powered grass karts which would go about 23mph. Quad Bikes were slow, big and buxom geared machines which were quite difficult to ride unless you were a farmer.